Martha B. Hopkins: hiking in Australia at 82 & the death of her son. It gets harder all of the time. Yesterday I passed a rack of birthday cards. No more birthdays. Last night rugby game between Australia and Wales: a shorter guy with strong build and cropped blonde hair–quite like Alex—was key to Australia’s win. I see an ambulance, I see someone stepping onto a bus or riding a bicycle. At last he is free from his struggles, including those that confront short, strong, funny, sensitive men in the meaner parts of the US. Is my son burning now? Have his strong bones turned to ash? will land on the few who can absorb them. The freshness of his humor will show. but I cannot hug, only love, one that is dissolving. it doesn’t matter now. Only that you are safe. Wednesday, October 26, 2011 in Arnhamland, Northern Australia, was the hardest day, physically, of my life. It was within just a hair of being too much, but worth every painful, thrilling, expensive, beautiful, revelatory moment. It was not just a fascinating experience for me, but also for the two Belgians, retired Australians and two young women that joined us. "Gary" was out guide, and Chris the out-van driver . First time I have seen an actual sunrise in Australia. Driving east at 5:30 a.m. from Darwin to Arnhamland–– from black skies driving through peopleless lands to dim lighting to bright, pale yellowing skies. A fortuitous glance in the right direction showed a little dark orange hill on the still dark horizon. Steadily it rose and became the blood orange sun that I had watched slide down into Darwin Harbor the night before. 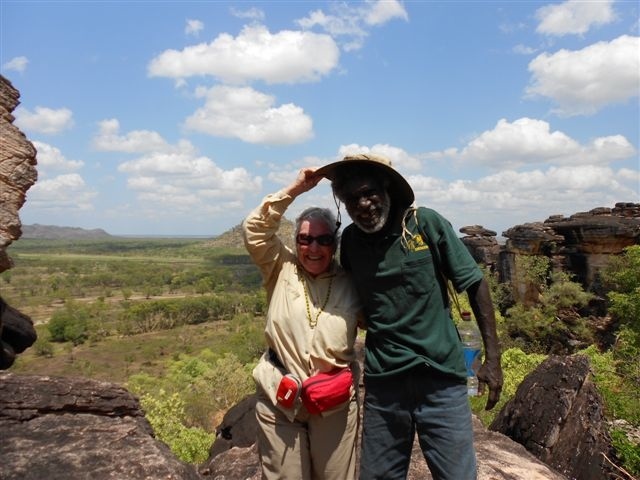 Our objective: 10,000 year old rock paintings on the underside of overhanging rocks of what is called Injalak Hill near the little village of Oenpelli, and learning something about the mysterious "dreaming" land of indigenous Australians. The trip could be as long and as complicated as the guide chose to make it. From what I gather now, I think we got the whole nine yards. The few tribes that are there are broken into clans and strictly observe customs that prevent the consequences of interbreeding. Ultimately everyone is related anyway and the sacredness of relationships is highly honored. The land has been studied geologically and culturally (from bones, DNA, etc) and in every other which way since the end of the last ice age. It is said that it has changed little. Miles-wide green flood plains between high plateaus became giant lakes during "The Wet." We climbed the face of a giant escarpment, like scrambling up toward Finger Rock (in Tucson) but more complicated. It was too hot to scramble, so we moved more clumsily picking our way upward into the rough mass of huge blocks, boulders, hunks, and wedges of silicified sandstone tilted every which way, often with just one narrow way around. Every few feet up I could see new canyons and obstacles, but we kept going. I was near the front, as always, so I could hear, but basically I couldn't hear much of the general talking. I could observe, though. At a fairly level stop, Gary, our graying but sprite indigenous guide, asks me if I had a camera. I said yes and he said let's take a picture of you and a black man to show your grandson. He was almost always peaceful and smiling at the humor of situations. I think it is his way of getting some people comfortable, with black and white folks touching each other. Many people have trouble with that, but not me. No rock was cold, just soft warmth that gradually became too hot to touch, especially the yellows, grays and browns. We kept drifting upward, often single file or just one or two of us at a time because the rocks were so close together. It was sometimes quite steep but I came to realize that Gary was always there and offering me his hand before I knew I needed it. Suddenly I was aware that this was one of those relationships that felt forever, where you fully understand each other and your own private mysteries. Complete trust. We finally arrived on a wide plateau under a huge overhang, covered with paintings. Gary stopped and in a prayer-like voice began speaking in his native tongue. We all were silent. He said he has asked the ancestors for permission to let us take pictures but that there will be some places NOT to take pictures. On some surfaces, always the underside of an overhang, the paintings are more dense. The longer I looked, the more I saw buried under each other. Gary speaks of the Lightning Man, the fish, the serpent, the honey bee. We kept moving slowly among the rocks, seeing and listening. At one place with a single figure, he said "no pictures." It was getting hotter and everyone was sweating and drinking from their water bottles. He sat easily, comfortably cross-legged, and explained the studies that determined that the paintings are 10, 000 years old. . . and that they, and he, and all of us will vanish eventually as "as a patch of water will vanish from a hot surface—with no trace that it ever existed." He gently describes that as an elder, he has no younger replacements. He knows and speaks of it. I know of it and hardly know what to say. At some time everyone has watched a puddle on cement shrink and shrink and disappear. It has always happened and will always happen. It is sometimes disquieting to contemplate, but he was so totally calm that it was inspiring to me. As we continued through a tight spot, the next obvious place I would have placed my hand was a narrow ledge, smooth as glass by thousands of hands over thousands of years. He said "not pictures," and then the next place he paused. He simply pointed to the right at a wedge-shaped crack, at the bottom of which was a recognizable skull. Judging from the fact that the back of the skull where the poor person's ear would have been faced me, I gathered that long ago someone probably fell head first from above. Or perhaps it has settled down there. What a helluva way to die, but even now it could happen. There would be no way to get down there except with one or two people like Gary carrying or dragging the injured or dead out. There were no paths, no place for a helicopter to land, just the rocks, an occasional plant and lizard, and the poop of some animal. Gary played here as a small boy. We continued into a box canyon with one wall tilted enough to preserve a complex red drawing with several stick figures around a more detailed one. Gary sat on a ledge, explaining that this was a portrayal of what happens when a member of the family dies. He stepped down and pointed at one of the small figures. I told him that my son had died three days ago. He smiled gently, without missing a beat, put his hand on a boulder and said "He'll be back." Gary was the only one who knew the routes and protected and guided everyone gently and ably. Because I was by far the oldest (nobody over 60) I was the first in line when we had to go single file––which was most of the time. And I soon learned that people behind me were very grateful that I was going slowly. Always I felt protected by Gary and it became like a slow motion dance––we didn’t say anything. I put my hand forward when I need a little steadying or support and when it was a complicated place, he silently pointed or put his toe on a spot that I was to use. Further on, quite high up, we had to cross by a place that had a severe drop on one side. The only way was to slide on your back between two horizontal rocks, at most two feet apart, by pushing with your feet. It too was smooth as glass from thousands of backs. There was no shortcut, no finding an easier way. It was all hard squirming but he always kept the pace moving. He would make a small gesture of pointing where I should put my hand or he would gently tap a rock where I should put my foot. One of my legs (broken years ago) was aching, my back was aching, my body was sweating, and my head and heart were pounding—and there were no choice but to follow him. We trickled into a "cooler," amphitheater-like formation and arranged ourselves in front of a ledge that had many stones and objects placed on it. No pictures were to be taken here. The only thing that looked like a "weapon" was a long stone spear point, which was used for spearing fish and animals. A couple of things looked like arrow heads but were kinds of scrapers and piercing tools. No weapons and no talk of war or violence. These are, and apparently always have been, peaceful people. How utterly refreshing, I thought. They don’’t worry about killing or overpowering other people and it shows in the lovely and relaxed attitudes. He explained the uses of one oval rock which he demonstrated by pounding lightly on his chest to remove phlegm, but not too hard because it was "too dangerous––" meaning don't pound too hard or you'll hurt yourself. the same phrase, "too dangerous," was used for scraping to remove or trim hair. Too much and you'll cut yourself. A small rock worn smooth on one side was a piece of red ochre. Red, yellow, orange and white are widely used by all tribes to make their distinctive designs, including "war paint," for some. But Gary just drew a few red stripes on his face. I was startled to see his red palm when he held up the rock. Later I asked to look at his palm, and sure enough, ours were as alike as two palms could be: a simian crease almost exactly like mine. We both just looked at each other and smiled. One of my greatest fears is turning or bumping my right knee in a way that messes with the hardware surgeons put in there years ago. I know what it is to turn just enough in the wrong direction so that the tips of the screws feel sharp inside and pointedly say it's time to change leg positions immediately. My right leg has become extremely strong in certain directions, but by using it so much that day, it was tiring. Fortunately lunch time came. Everyone was dripping and exhausted. Chris had climbed up with drinks and the makings of hearty ham and cheese sandwiches. By that time I simply could not lift my leg up the big step necessary to see the view of immense distances, but one rock down, I still had a commanding view of the giant green flood plain and distant formations. Right near me was a smooth rock with a little tilt—a perfect bed—and another smooth rock for a pillow in just the right place. I almost fell asleep. My back stretched out and I rested, which I must do several times a day since there is no cartilage between some of my lower vertebrae. It had gotten really hot as we worked our way down through another tight slot canyon, past the never-ending rock, I thought I was going to collapse. The paintings got sparse, and while more interesting in some subject matter (like fishing), they were less interesting than safely getting down. There was no choice but to keep going. Gary kept the pace very slow with many stops. We were all bright pink and pouring sweat, but everything around us was so beautiful that there were no words of complaint. Just awe. I didn’t think I could go another millimeter—I felt tested to the max. But I made it. It felt wonderful to have a new soul-mate. . . a forever friend in Gary. I doubt we will ever meet again, but I had a sense that I think we both felt. He helped me understand the loss of my son. I think none of us can redefine our birth—our surroundings, the people that are immediately upon us, what has been decided for us to learn, or not to learn—and become comfortable with what we think is fixed. . . or change it, accept it, or suffer. In the few hours during the rugged hike on the Top End of Australia last year, my life took on a richness hard to explain, and one that is with me permanently. Martha B. Hopkins, author of Second Chances: A Travel Narrative of Southern Africa, has been a geologist, journalist, real estate broker, civic activist, and writer of non-fiction articles. She lives and writes in Tucson, Arizona.